﻿ Celta Vigo 2-4 Real Madrid. And the title race is still on! 26.04.2015 » Celta Vigo 2-4 Real Madrid. And the title race is still on! Real Madrid has passed another tough test in their Spanish League campaign, after visiting and defeating Celta de Vigo 2-4 this Sunday night. Cristiano Ronaldo didn't get to put his name on the scoresheet, but saw Kroos, James and Chicharito all scoring goals and securing the important 3 points for the Merengues. It's a game that would have caused a few heart palpitations from fans of Los Merengues, but in the end, Real Madrid were able to notch a tough victory at the Bailados stadium against a plucky Celta Vigo side. Again it was Chicharito, who's been in a rich vein of form of late, who would be the hero by scoring two important goals, one in each half, as Real Madrid eked out a 4-2 victory in an end to end encounter. Carlo Ancelotti's men will remain 2 points behind Barcelona, but now with only 5 fixtures left for the end of this La Liga season. Is Barça still going to slip in any of their games coming ahead? Can Real Madrid keep up with this pace and pressure right until the end? It was end to end stuff from the get-go, as Madrid's fullbacks were constantly caught out again and again by the quick passing of Celta Vigo, which kept finding various holes in the Madrid backline throughout the whole game. And it wouldn't be too long before Celta would capitalize. The hosts' star man, Nolito, opened the scoring in the 9th minute after some brilliant dribbling on the left flank. Picking up the ball on the wing, he cut through both Dani Carvajal and Asier Illarramendi, before freezing Varane and tucking him a near post shot past a motionless Casillas. The goal seemed to kick a sheepish Madrid into high gear and seven minutes later they would be level. The play was once again originated near one of the sidelines, but this time with Cristiano Ronaldo taking the main role. The Portugese winger's center into the box was cleared right into the path of a perfectly positioned Toni Kroos, who was waiting for the ball at the penalty spot. Kroos would smartly place the ball into the corner of the goal and tie the game at 1. Real Madrid would then pile on in search for the go ahead goal, and they would get it soon after one of the best attacking moves of the season. Chicharito and James Rodriguez would put their connection on display, bamboozling the Celta de Vigo defense with a series of quick exchanges that the little pea finished neatly, by sending the ball through the legs of the keeper. But Real Madrid's leaky defense would again find themselves at fault, as Mina would tie it up again for Celta. A through ball in behind the defense caught Marcelo out and though Casillas would do all he could to deflect the ball onto the post, Mina followed it right to the line, smashing home the rebound. With just two minutes before the end of the half, Real Madrid would take the lead again. This time, the scorer would be the man who set up the second goal, James Rodriguez. The Colombian's deflected shot from outside the box trickled passed a helpless Sergio. Tough luck for Celta Vigo, but a vital moment in this season's title race. In the second half, Celta piled on the pressure. Nolito in particular looked fantastic, tormenting Carvajal over and over. But for all their industry and good play, they simply couldn't hit the target. Eventually Real Madrid would seal off the game through none other than Chicharito. Picked out by a terrific Sergio Ramos' lob over the top, the little pea ran onto the ball and slotted home his second of the match and Madrid's fourth on the night. After his heroics in the midweek, he seems to now be brimming with confidence, becoming a bigger and bigger part of the squad. It wasn’t easy in the end, and Madrid were quite lucky at times, but the Merengues keep marching on with their hopes of still winning La Liga very alive. 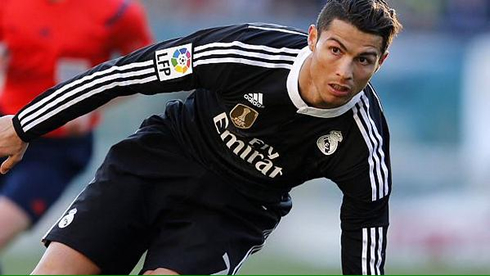 Cristiano Ronaldo next game will be for the Spanish League and against Almeria, on the 29th of April of 2015. You can watch Juventus live stream, Real Madrid vs Almeria, Barcelona vs Getafe, Hull City vs Liverpool, Leicester vs Chelsea, and Bayern Munich vs Borussia Dortmund, all matches provided from our soccer live streaming section.